In order to view and access the Invoicing tab you need to have assigned to your dashboard user account the proper access rights (Invoicing-view). 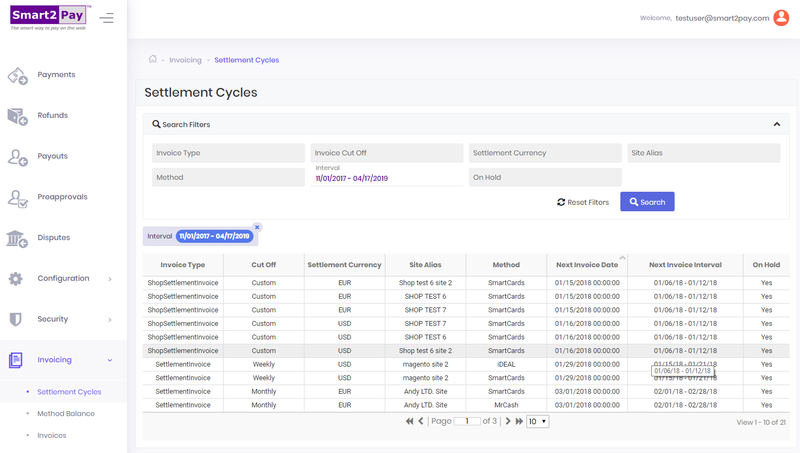 Smart2Pay is managing a complex schedule of settlements, and depending on the payment methods you are using, you can be settled in various cycles with various cutoffs. By accessing the Invoicing tab->Settlement Cycles view, you can see important information on the invoicing/settlement cycles, invoice date, cutoffs and if any invoices are expected to be delayed. You have the possibility to search for specific cycle using different criteria. When you access the Invoicing tab->Settlement Cycles view, the Search Filters section is expanded. In order to collapse it just click the arrow on the right of the screen. : if set to no, invoices will be automatically generated and process by the system. If set to yes, it will be manually processed by our financial team when certain conditions are met.